See GemStone/S 64 Bit v3.3.9 for more information. GemStone is pleased to announce the the development of open-source Jadeite and Rowan for GemStone products. These products will allow GemStone customers to do sophisticated Smalltalk code management and application development directly in GemStone Smalltalk, with an underlying git repository providing fully-featured version control. Rowan is a project and package manager for Smalltalk that stores Smalltalk code in the Tonel or FileTree file formats. Rowan for GemStone is an implementation of Rowan that is integrated with GemTalk’s GemStone/S 64 Bit™ product, to allow Rowan’s code management to interoperate with GemStone features such as user-based object-level security. Rowan stores code as text in a disk Git repository, and basic Git operations such as pull and commit can be done from Jadeite, Rowan, or directly at the command line. Advanced Git operations can be done at the command line. Jadeite is a Dolphin-based Smalltalk application that runs on Windows, based on James Foster’s Jade application. Jadeite provides a graphical user interface for GemStone Smalltalk development. Jadeite provides single name-space, server-only execution, with browsers specifically designed to work with Rowan projects and packages. 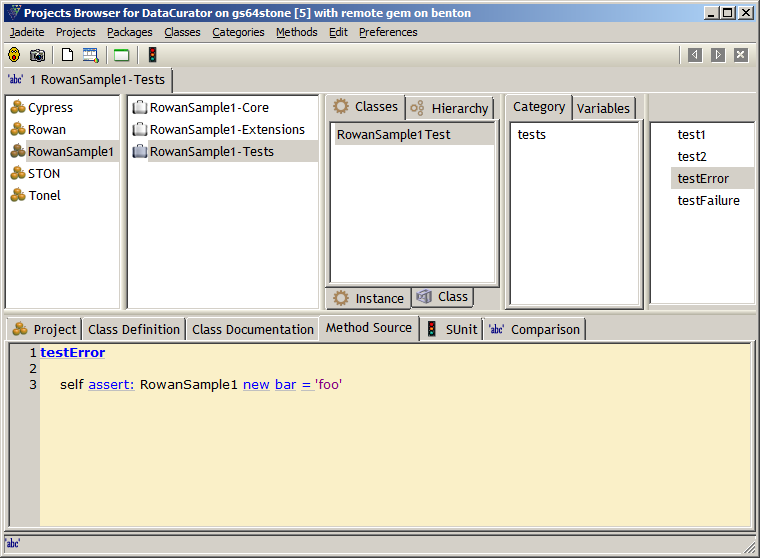 Jadeite supports code development and debugging in a GemStone repository that has Rowan for GemStone installed. These products join the existing code development solutions for GemStone, which include GemTalk’s GemBuilder for Smalltalk for use with Cincom’s VisualWorks client and Instantiation’s VA Smalltalk, and other open-source environments such as GsDevKit. GemStone/S 64 Bit provides a fully-featured and documented API. These open-source products are under development in cooperation with a large banking customer, for use in their development and production GemStone applications.